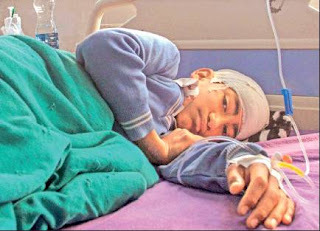 Two schoolchildren were injured, one of them critically in the head, when stone-pelters attacked a bus carrying 50 students in Shopian, drawing sharp criticism against the amnesty granted to stone-pelters by chief minister Mehbooba Mufti last year. Three tourists were injured in other stone-pelting attacks in south Kashmir, and in Memander village, a mob lobbed a petrol bomb at the house of PDP MLA Mohammad Yousuf Bhat. No casualties were reported. Ritu Devi of Mumbai was hit on her head after stones were pelted at her cab between Awantipora and Bejibehara in Anantnag district. SSP Shopian Shalender Kumar Mishra said that the school bus of Rainbow International educational institute was attacked by a mob with stones near Zawoora village in Shopian at 9.25 am. The stones hit the children as the glass windows were mostly open. Former CM and National Conference working president, Omar Abdullah also lashed out. “How does pelting stones on school children or tourist buses help advance the agenda of these stone-pelters? These attacks deserve our unequivocal condemnation,” he tweeted. In other stone-pelting attacks that took place on Monday evening in Anantnag, three tourists were injured. On the same day, security forces gunned down two Hizb terrorists, including a top commander, Sameer Tiger, triggering protests.